The “Infectious Diseases Twitter Highlights” column presents recent twitter posts that are of particular interest to the infectious diseases community and provides commentary. This is the summary for the third week of July 2017. Commentary: Over 1.6 million ED visits and nearly 500,000 inpatient admissions occur every year due to acute asthma exacerbations. Current clinical practice guidelines published by the Global Initiative for Asthma (GINA) recommend against the empiric use of antibiotics for patients with recurrent asthma exacerbations, given that most cases are caused by viral pathogens and studies to date have shown mixed results. However, we know a large percent of patients are prescribed antibiotics for acute exacerbations despite these recommendations (take a look at the number of patients excluded from the AZALEA study published last year due to recent antibiotic use). Some feel that Azithromycin might provide additional benefits in this population, beyond its antimicrobial activity, due to its antiviral and pleotropic effects. The AMAZES study from Australia sought to determine if extended use of azithromycin would decrease the rate of total (moderate or severe) asthma exacerbations as well as improve quality of life. This large double-blind RCT compared adult patients with uncontrolled persistent asthma despite a maintenance treatment who received azithromycin 500mg three times/week or placebo for 48 weeks. They found a significant decrease in the number and severity of exacerbations compared to placebo as well as improved QOL scores. Although the results were positive, we need to appreciate the concerns for toxicity (arrhythmias, ototoxicity) and drug resistance with long-term use. Further study is warranted to identify the ideal patient for this intervention. According to the CDC, 30% of antibiotic courses prescribed in the outpatient setting are inappropriate. Antibiotics are in the top 3 drug classes leading to adverse drug-related ED visits for all ages. One study showed that a 10% decrease in inappropriate prescribing in the community can result in a 17% reduction in Clostridium difficile infection. Outpatient antimicrobial stewardship (including the emergency department) is desperately needed and a growing area of interest for research. This study out of France looked at the impact of implementing stewardship in the emergency department at a tertiary university hospital. The hospital has 497 acute care beds and the ED has about 35,000 visits per year, if you are curious to know how it matches up to your institution. They dedicated a 0.2 FTE ID specialist (it is not clear but I am guessing it was a physician) to reviewing and advising on antimicrobial prescribing in the ED. The ASP provided education every 6 months to the ED residents, a pocket handbook with recommendations, a dedicated ED physician antibiotic champion, and twice weekly check (and feedback?) by the ID specialist. They were able to show a significant reduction in non-compliance with guidelines (62.9% to 46.7%), which was driven mostly by unnecessary antimicrobial prescriptions (25.6% to 17.4%) and inappropriate spectrum (14% to 9.3%). I applaud them for their efforts, but imagine it would be difficult for most institutions to dedicate that many resources to outpatient stewardship in the ED. I also wonder if these interventions impacted appropriate prescribing in patients admitted to the hospital. Commentary: As mentioned previously, 30% of outpatient antibiotics are inappropriate, leading to a staggering 47 million excess prescriptions per year. One of the biggest challenges to implementing meaningful change is the lack of provider level data to audit and give feedback. Aetna and the CDC decided to work together on an initiative to educate providers on antimicrobial stewardship and decrease inappropriate prescribing for acute bronchitis. When Aetna reviewed data from in-network providers in four select specialties, 1,115 outliers were identified, meaning they prescribed antibiotics > 50% of the time. Another 127 providers were considered “high avoidance success,” who avoided prescribing antibiotics 100% of the time for acute bronchitis. These outliers were subsequently sent the letter attached to the tweet above. Link to website is here. There are over 15,000 long-term care facilities in the U.S. serving nearly 1.5 million residents. 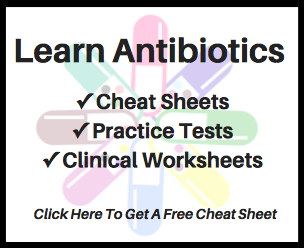 Up to 70% of residents in a nursing home will receive one or more courses of systemic antibiotics per year and somewhere between 40-75% of those courses may be unnecessary or inappropriate. Both CMS and The Joint Commission have now implemented new requirements for antimicrobial stewardship programs in long-term care facilities. Pharmacists will play a key role in the success of these programs and are in need of training in infectious diseases and stewardship. The Society of Infectious Diseases Pharmacists (SIDP) and the American Society of Consultant Pharmacists (ASCP) have developed an Antimicrobial Stewardship Certificate Program to meet this need. This program consists of 3 phases, online self-study, live webinars, and a skills component conducted at a practice setting. Commentary: By now, most of you have heard about the Cochrane Review published last month on Direct-Acting Antivirals for Chronic Hepatitis C, available here. The authors felt that there was no clear evidence that DAAs have any effect on the risk of hepatitis C-related morbidity, all-cause mortality, or risk of serious adverse events. They also questioned the value of sustained virologic response (SVR) as a surrogate outcome. As you can imagine, this set off a fire storm in academic circles and social media. It also led to a joint response letter from the leaders of IDSA and AASLD, who felt compelled to address some of the limitations of the review. As someone who does not work in the Hep C arena very much, I highly recommend you read both perspectives before making any judgement and check out this excellent blog post from Dr. Paul Sax, available here. Commentary: Next time one of your colleagues at work brags about how great the latest “-ixaban” drug for cardiology or “-nib” drug for cancer is, show them this graphic, drop your Mic, and walk away knowing vaccines still rule the drug world for outcomes.